Today Vitamix sent out an email to all subscribers explaining the latest Pre-Holiday sale that will continue until Black Friday arrives next month. The details around this sale are similar to what you can already get here at BlendToTheEnd.com. When you purchase any blender, you will automatically receive free shipping when using promo code ’06-009709′. The Vitamix Standard Reconditioned Blender is still available for only $299 plus free shipping when using promo code ’06-009709′. Here at BlendToTheEnd, we still feel that this is the best deal that is currently available at Vitamix.com. As mentioned in our last post, we recommend this blender over the Vitamix S30 because it has a better price point and provides increased flexibility with what it can make, especially soups and dips. The Vitamix Pre-Holiday Sale really is the same deal that we provide you everyday. Free Shipping on all Vitamix blenders and an additional $30 off Vitamix Standard Reconditioned Blender. This drops the final price to $299. Vitamix has a number of different reconditioned blenders that are now on sale and will be shipped for free. All of these machines are listed below. Use promo code ’06-009709′ to make sure you receive FREE SHIPPING.. We expect this deal to be available until Black Friday. Below is a list of all of the Vitamix Reconditioned Blenders. The Vitamix Standard Reconditioned Blender is one of the top 3 selling blenders on Amazon.com. The top 3 selling blenders on Amazon.com include blenders manufactured by Vitamix, Nutribullet, and Ninja Professional blenders. 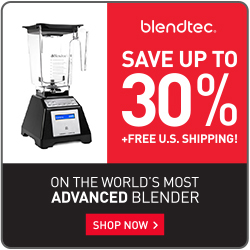 Blendtec is also one of the top selling blender brands available at Amazon. If you have any questions regarding this Vitamix sale or any other personal blending equipment, please contact us!